Whether you have no grill or it’s just raining or too hot or cold outside – here’s an Easy Oven-Baked Barbecue Chicken Recipe! Some of my favorite Summer eats are salads, fresh fruit and barbecue anything with a nice tall glass of sweet iced tea or lemonade. However, we aren’t all lucky enough to have a grill or Mother Nature decides to rain on our parade – literally. What are we to do? Oven barbecue, of course! It may look like a lot of seasoning, but these are big pieces of chicken and some will come off during cooking. 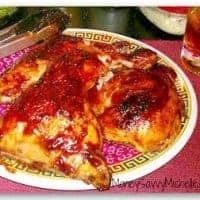 The nice thing about this super easy oven-baked barbecued chicken recipe is that you can tailor it to your families’ tastes and make a small or large amount very easily. Prefer making your own bbq sauce or have a super secret family recipe for a barbecue rub? Feel free to use those instead! Note that this recipe does brown the chicken first. You don’t have to do this, but I much prefer a crispier rendered skin versus the tasteless flabby skin you sometimes get from just baking. Doesn’t browned skin just look more appetizing? I love having a good roasting pan to make this chicken. Cooking Oil - I loved using Tropical Traditions Coconut Oil for this! Preheat oven to 350° F with oven rack in middle position. Pour enough cooking oil to coat into bottom of your baking dish if it can be used on the stove or into frying pan if it can't and heat over medium high. While pan is warming up, season your chicken with dry ingredients. Your chicken will have more flavor if you take the time to season both the skin and under the skin. 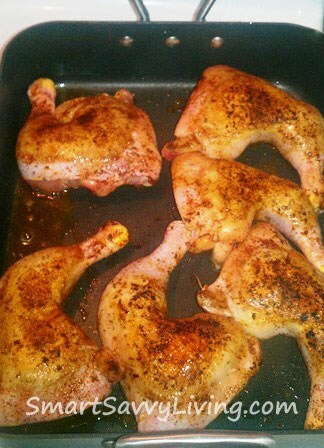 Lightly brown chicken on both sides. Brush both sides of chicken with barbecue sauce. Again, if you brush under the skin, the chicken will be more flavorful. Cover with foil if you don't like the skin on the darker side. Exact baking time will depend on the cuts you use and your oven. For the 6 leg quarters, I baked uncovered for about 1 hour and 15 minutes. If you have a meat thermometer, you'll want to bake to an internal temperature of 165°F, remembering that the temperature will rise a couple degrees after you remove the chicken from the oven. 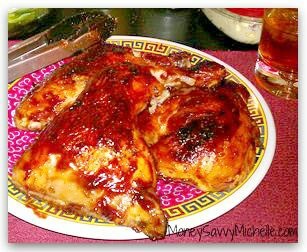 Baste chicken every 30 minutes with more bbq sauce, removing foil about 30 minutes before it's done or broiling a few minutes, if you like your barbecue chicken to be sticky versus saucy. Tent with foil and allow to rest 5-10 minutes for juices to redistribute for yummily moist chicken. Sauced and ready to go into the oven. I hope you enjoyed this Easy Oven-Baked Barbecue Chicken Recipe – be sure to check out our other recipes like my Mustard Potato Salad for a delicious side dish! 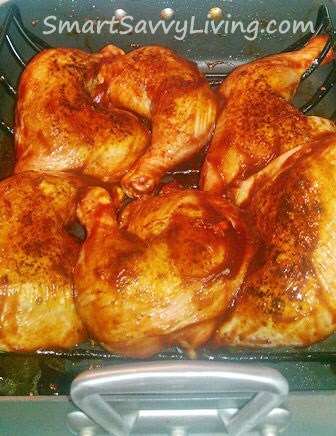 I love easy recipes and you just cant go wrong with barbecue chicken. I think my family would like this one. Now I can have barbi’d chicken as I don’t have a grill! And now I know the secret to the crispier skin – wow – I hit the jackpot. and now I must run off to get the chicken!! I’m so hungry! I read that new studies are linking cooking with aluminium foil to Altizermers. Since the older generation used it alot to cook with then they are mostly suffers of this. Thanks for stopping by. It seems that the Alzheimer’s Association calls this a myth about using foil. You can find more info here: http://www.alz.org/alzheimers_disease_causes_risk_factors.asp. Barbecue chicken has always been my favorite. This one’s a new variation I wanna try.